The grave of a missing First World War soldier has been discovered by historians in the north of England. 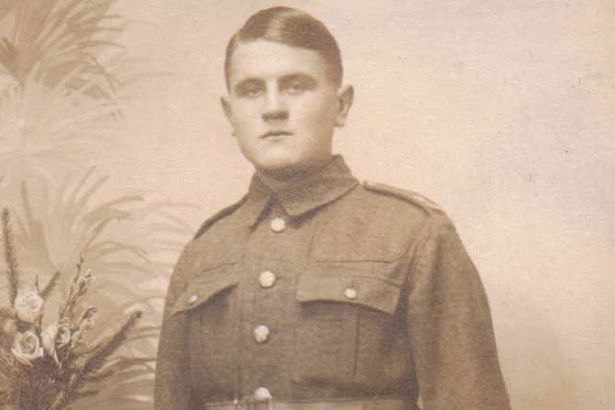 Private Edward Pratt, of the Durham Light Infantry, was a former quarryman who fought at the battles of the Somme and Passchendaele and was wounded in action on two separate occasions in 1916. In October the following year, he sustained injuries in a bombardment that left him with partial paralysis. He died of his wounds in September 1918, aged just 26. Four years later his widow also died – leaving the couple’s three children (all under the age of 10) as orphans. His grave was never marked, and Private Pratt remained a forgotten casualty of the First World War for almost a century. His tale came to light when members of the Aycliffe Village Local History Society set out to research the stories of the 13 men whose names were carved on their village’s war memorial. An appeal for information was spotted by his granddaughter Margaret Prest, 74. ‘I was so pleased to find him after all these years,’ she said. ‘All the facts fitted. I read it and I was crying. This entry was posted in News and tagged 1916, 1917, 1918, Durham Light Infantry, Somme. Bookmark the permalink.